Many visitors to Bakkrans are keen to learn more about the wildlife in the reserve. The best way to do this, of course, is to do some tracking on foot. For us, tracking is one of the most valuable tools to manage the reserve properly. 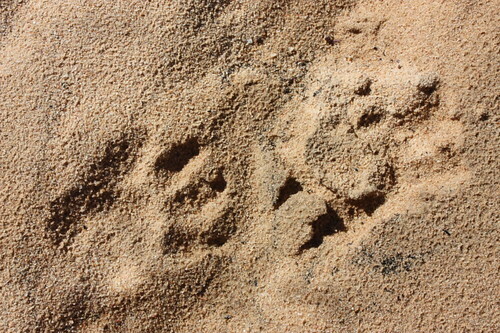 Tracks and signs in the veld show you important information such as when and where particular groups of animals feed, how many animals there are, whether they have offspring, which predators are around, which water points are utilized, and many, many more important things. It is actually possible to get a complete picture of animal movements and habits without physically seeing them. For this, you need a keen sense of observation. Bakkrans also has huge sandy plains between the mountain ranges, where tracking is indeed very easy, even for the less experienced. Furthermore, Oom Arrie, the reserve manager, is always willing to accompany visitors. Previous visitors to Bakkrans, gave us the following short recount of their experience of a day’s tracking in the reserve. "We got up at early dawn on a beautiful spring morning. While we were having our first mug of coffee and rusks, we heard alarm calls from klipspringers not far away. This was unusual, it still being so early in the morning. We eagerly (wishfully, perhaps) concluded that they must have been disturbed by some kind of predator – maybe a caracal, or even a leopard? This was an exciting thought! We set out to investigate and soon spotted the klipspringers, by then quite calm, gazing at us from the top of a range of massive boulders. We were near some age-old klipkraals, now almost totally overgrown by massive taaibosse and klipkerse (local name). Although we explored the area well we found no trace of any predator tracks and later returned to camp for breakfast, none the wiser. But, it was a perfect start to our day. This was actually our second trip to Bakkrans. On a previous visit, we found that the reserve has an abundance of game and we were eager to explore the reserve on foot, checking tracks and following spoor. We wanted to read the Bakkrans daily newspaper, “as it is written on the ground”. We spent most of the day walking, firstly along the higher plateau areas and then down to the lower plains. After much exploring we had seen some fascinating things, too many to describe in this short recount. A few memorable finds stand out though and I will tell you about it in a bit more detail. We left camp after breakfast, eyes to the ground, so to speak. Our first find, however, unexpectedly, was a well-hidden nest of the scarce Karoo canary, almost 1½ meters off the ground, with four beautiful eggs. This was pure luck, but what a find! We obviously had to be more alert to our overall surroundings. Later we found a large klipspringer dung midden (latrine). Judging from the size and obvious age of this midden, it has definitely been in use by many generations of klipspringers. Of particular interest was the larger, round dung pellets also found on the midden. We were later told that is dung from the small reddish rock rabbit, which apparently habitually utilize the same facilities as the klipspringers. Fascinating stuff! Upon reaching the lower sandy plains of the reserve we were immediately surrounded by an abundance of clearly recognizable tracks of many different animals, birds and all kinds of goggas. There were those of two parent ostriches, together with the exquisite tiny spoor of about fifteen of their very small chicks. This was awesome and a first for us. We decided to proceed in the opposite direction, not wanting to bump into annoyed ostrich parents. We followed the tracks of an aardvark from where it had emerged from a well-used burrow the previous night. Whilst checking its wanderings and diggings, we found some large leopard tracks. This was a big boy! We followed his spoor, hoping (why not?) that we would stumble onto a possible catch. This was not to be though, as we lost the spoor after about a kilometer, where it disappeared onto rocky ground. We could not help wondering if this elusive cat wasn’t perhaps watching us at that very moment from the safety of the high upper cliffs. Another new for us was to find the spoor of an owl where it had walked in a zig-zag pattern on the ground the previous night for about twenty meters, its massive claws clearly etched in the sand. This was something amazing to see and we wondered how many people ever get the opportunity to experience this. Unfortunately, we were not able to determine for what reason it was actually walking around on the ground. Wish we could. Talking of birds – we found various ground birds i.e. sand grouse, quail, korhaan, etc. When we stumbled onto a pod of partridges where they were busy digging for bulbs, they didn’t bother to fly up, but just scurried away amongst the surrounding bushes. This was so typical of the tameness of most wildlife at Bakkrans. We found a spot where a ratel had partly destroyed the substantial woody nest of a Karoo rat in a gannabos. After inspection, we concluded that the ratel actually had managed to catch at least one unfortunate rat. After this mayhem, there was some serious restoration work to do by the remaining (?) rat family. We wondered if the crow family, which nested on top of an old windmill tower nearby, saw this event happening since ratels are not necessarily nocturnal. By the way, these crows had no less than five beautiful blue eggs in their well-constructed nest. Part of the lining in the nest was a piece of old sheepskin with plenty of wool still attached. We wondered where they had found this, since we reckoned the nearest sheep farm must be at least 80kms away, as the crow flies (pun intended). They obviously fly that far on their daily excursions. We followed the spoor of a group of Cape mountain zebras as they moved along the lower edges of a mountain ridge, trying to determine what different plants they actually feed on. I must hasten to add that our knowledge of plants is dangerously limited. The group we followed had two small foals with them, which were very playful since their tiny tracks showed how they ran big looping circles amongst the grown-ups. We got to a well-used spot where they rolled in the dust – a favourite pastime. We read somewhere that the youngsters, while still small, can roll over on their backs from one side to the other when taking a dust bath, but the adults cannot do that. We eventually caught sight of this group, nine in total, which proved to be quite tame and equally interested in our inquisitiveness. They kept their distance, however, moving a little higher up the mountain side and we could not get closer than about 200 yards from them (in a vehicle you can sometimes get up to 50 meters). What a treat though to see these highly endangered zebras, they are such beautiful animals with their proud demeanor - easily the most handsome of the zebra species, we think! We saw many other tracks of gemsbuck, springbuck, jackal, caracal, bat-eared fox, porcupine, tortoise, dung beetle, etc - you name it. At one spot, a jackal had chased a hare over a distance of about 100 meters, but the hare seemed to have escaped unharmed. We returned to base at sunset, hungry and weary, but in a blissful way. We had had a brilliant day!" We are back from our 6 weeks adventure trip through South Africa and Namibia. We made nearly 3000 digital photos and many video films. We saw a lot of very nice places and very nice landscape, but one of the highlights was Bakkrans with the stone houses. Never before I was on such an isolated and quiet place - and as a geographist I have seen a lot of places in the world. That is what I love, because you will not find it in Europe and even in southern Africa there are less and less places like your Bakkrans. This was the 10th time within more than 40 years that we visited southern Africa and every time all the nice places are more and more crowded. So thank you very much again that we could stay in your brilliant restored stone houses. Perhaps you can print the photo and give it to Arrie, he is a very nice man. He showed us a lot of the landscape, several animals and the bushmen paintings. "Bakkrans is such a fantastic place, we so enjoyed every aspect of it. The attention to detail is so subtle and so appropriate to the site. I took many photos of the wonderful landscape, the cottages, even the catches on the windows. It was also amazing to be able to have exclusivity. We enjoyed also the information book and the style in which it is written. The modesty of the way you have done things is outstanding." "What a hidden gem Bakkrans Reserve turned out to be for us, an earthy place, fortunately not spoilt by offerings of excessive luxury. We all enjoyed the opportunity to explore this beautiful landscape at a gentle pace, setting our own timetables. We particularly enjoyed walking the Leopard Trail, and the stars at night were absolutely amazing! We have to commend you for allowing the local craftsmen freedom to express their “hand-made” mastery when building and restoring the houses. Their unpretentious styling, together with the sensitive layout, allowed Bakkrans to evolve into something very special indeed. Your light footprint is an example of responsible tourism to many in the industry. Well done!" “Over many years I have travelled more than 200 000 kilometres in and around Africa. I was stunned to find a place like Bakkrans, hidden right here on my doorstep in the Cederberg Karoo – a place with truly spectacular natural beauty and unspoilt serenity, unsurpassed anywhere else around here. "We have just returned from our third visit to Bakkrans. Thanks again, for sharing this very special place with us. We so much enjoy the freedom and clean air. What we find most pleasant, is that there is no need at all for us to get into our vehicles at any time to explore this beautifully sculptured landscape. The klipspringer family spent a lot of time amongst the houses and we were amazed at how nonchalant they were. The youngster can only be a few weeks old, but is already an expert on the rocks. Please let us know when next the black eagles are nesting in the waterfall as we would love to witness that". "Thank you for a unique Cederberg experience. We spent a peaceful weekend knowing that the whole reserve was ours to enjoy exclusively. We just loved the authenticity of Bakkrans, especially since it is without the usual hi-tech facilities found everywhere else. Please don’t change this formula!" Thank you for letting us visit this very special place. We’re hoping to return soon. "Ons ry al vir jare deur die Cederberg en kon nie glo dat ‘n plek soos Bakkrans al die tyd daar weggesteek is nie. Die aardsheid en eenvoud is fantasties om te ervaar. Komende vanaf Springbok, was ons aangenaam verras om al die blomme op Bakkrans te sien. Wat ‘n fonds! Ons kom definitief weer!"